From midnorthern latitudes in June, Scorpius and Libra are at their most visible around midnight. Find a low southern horizon if you want to see Scorpius in its entirety. Last week we spoke of the ecliptic, that mysterious line inthe sky along which the sun, moon and planets seem to move. It has been calledby other names such as "the Road of the Sun." The constellationsalong the ecliptic are called the "zodiac." Of the twelve zodiacal constellations, Libra is the onlystar pattern that does not represent a person or an animal. Is it Lee-bra or Lī-bra? "Listen," he said, "the correctpronunciation is "Lī-bra," not "Lee-bra." Remember,you go to a lī-brary, not a lee-brary!" I initially did not believe him, especially since I knewthat the word library had its origins from the Latin word "libraria"(meaning book), while Libra was Latin for "balance," hence twototally different things. But when I returned home and did some checking, I foundthat the World Book Encyclopedia (Field Enterprises Educational Corporation)indeed suggested the pronunciation LY-bruh, while The American HeritageDictionary of the English Language (Houghton Mifflin Company) deems bothLī and Lē as acceptable. Now, whenever I look at Libra, I always think of my formerHayden colleague and in deference to him, stress the Lī. Known as "The Scales" or "The Balance," Libra is marked by anoblong figure of stars and owes its importance only to its position in thezodiac. It supposedly consists of a beam with two pans hanging from it, forweighing things. The load in the right-hand pan must be heavier, for thebalance is tilted down on that side. Libra was once associated with theconstellation Virgo, as the scales of the goddess of Justice which that figurewas supposed to represent. 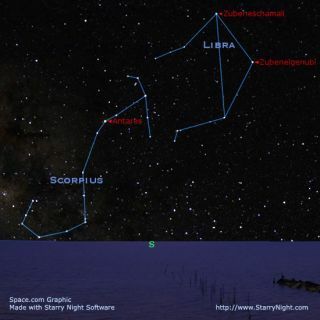 Just to the east (left) of Libra on these early Juneevenings, the most beautiful zodiacal constellation can be found emerging intoview low in the southeast sky: Scorpius, the Scorpion. Scorpions have two largeclaws in front, but this one seems to have had his claws clipped. In fact, theclaws were indeed cut off to form Libra. A few thousand years ago, Romansdecided that there should be 12 constellations in the zodiac, instead of11, so they made the two claws of Scorpius into the arms of Libra, the Balance. Libra was also known as "the Claws" of Scorpius,the Scorpion, to the poet Aratus and others of classical times. In fact, two ofLibra's stars still bear the Arabic names, Zubeneschamali and Zubenelgenubi,meaning respectively, "Northern Claw" and "Southern Claw. "Zubeneschamali also has a very faint greenish tinge: the only green naked-eyestar. The whole figure of the Scorpion is a magnificent sight —sort of a "celestial fishhook" — and is best appreciated now in adark sky without any interference from bright moonlight. It really looks like ahuge scorpion, with its long stinging tail curled over its back. I should pointout here that the currently accepted name of this constellation is Scorpius,not Scorpio. Principally astrologers (and some older astronomy books)use the latter for labeling the zodiacal sign of that name. One star clearly outshines the others, with a fiery tingeseemingly emphasizing the Scorpion's sinister appearance. That's Antares, theso-called "rivalof Mars," "Ares" being Greek for Mars. Antares is a supergiant, 700times the sun's diameter, over 9,000 times as luminous and located 604 lightyears away. And lastly, the stars Shaula and Lesath are a close pair of starsin the Scorpion's stinger. Astronomy popularizer Hans A. Rey (1898-1977)christened these stars the "Cat's Eyes," noting, "You will findthe name quite fitting."